Bioshields help build resilience, not just resistance to hazards. Unlike single-purpose interventions such as seawalls, bioshields provide diverse ecosystem services that help support healthier and stronger communities, including air and water purification, increased biodiversity, food, and other livelihood resources. And unlike built environment fixes, which are often more rigid and can weaken over time, bioshields are flexible and adaptable. To help us adapt to climate change, we should preserve and expand bioshields—but only in consultation with the local communities, or we risk increasing the vulnerabilities that we hope to resolve. Deadly heat waves are becoming increasingly common as more people move to cities and climate change increases global temperatures. Cities concentrate and magnify heat in what is know as the “urban heat island” effect, making heat waves even more lethal. 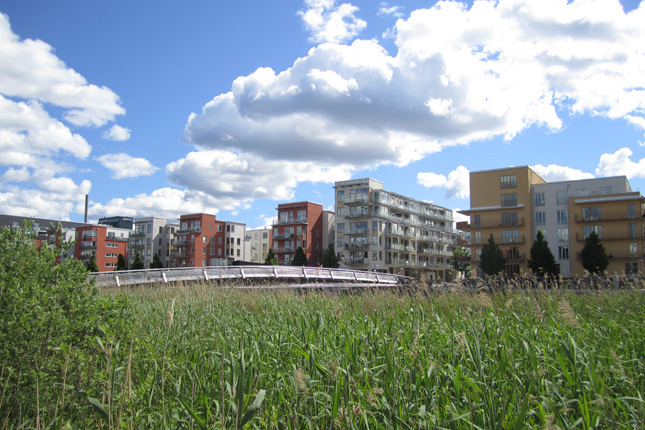 Urban green spaces can help reduce the effects of urban heat islands. Urban parks, green roofs, and gardens produce a cooling effect due to evaporation and transpiration, converting heat that would normally be released into the environment. Large parks have been shown to provide a cooling effect of nearly six degrees Celsius. Other smaller-scale interventions, such as street trees, can also have significant effect: on a sunny day, a single tree can have cooling power equivalent to 10 air conditioning units. Sea-level rise, urban development, and population growth are increasing the vulnerability of coastal communities. According to statistics from the most recent U.S. census, 123 million people, or 39 percent of the U.S. population, live directly on the coast. More than 50 percent of the population lives in coastal watershed counties, which border directly on the ocean or are considered high-risk coastal areas by FEMA. Coastal populations are growing, and the number of people living in coastal regions of the United States is predicted to rise to 134 million by 2020, putting even more people at risk of coastal hazards. Coastal wetlands protect against flooding by acting like natural levees. Marsh vegetation and roots capture sediment that helps to stabilize coastlines and increase the height and volume of protective wetlands—further increasing their effectiveness against flooding and sea-level rise. Prairie wetlands also mitigate the impact of floods by acting like a sponge to soak up and attenuate floodwater. The destruction of Houston’s Katy Prairie was one reason the August 2017 floods did such enormous damage. Forests along the coast also block storm surge, floods, winds, and debris. In tropical and subtropical areas, mangroves are particularly effective. During the catastrophic 2004 Indian Ocean tsunami, mangroves reduced the strength of the tsunami waves, and areas located behind robust mangrove forests experienced less structural damage and destruction. And in the 1999 Orissa Indian super-cyclone that killed more than 10,000 people, coastal areas with dense mangrove forests experienced fewer deaths. While the degree of protection that mangroves may have offered is debated, some research suggests that had been more intact mangroves along the coast, as many as 90 percent of the deaths may have been prevented. Mountain and hillside forests can also reduce destructive landslides by limiting erosion, regulating soil moisture, and stabilizing soil with their root networks. Landslides cause billions of dollars of damage and thousands of deaths each year. Globally, between 2004 and 2010, more than 32,000 people were killed by landslides, excluding those triggered by earthquakes. Forested lands have been shown to have 5-10 times fewer landslides compared with landslide rates in the same areas after significant deforestation. Despite their benefits, bioshields can also have negative consequences. Green interventions can have socio-political impacts in addition to ecological ones, and the development and conservation of green spaces is often contested. Urban greening can contribute to environmental gentrification by increasing the desirability—and housing prices—in greener neighborhoods, thus displacing lower-income residents. In post-Katrina New Orleans, the city’s plans to convert flood-damaged and predominantly African-American neighborhoods into green space spurred outrage because similarly damaged but mostly white neighborhoods were left in place. As some neighborhoods become greener and less polluted, other areas may bear disproportionate toxic burdens. Shifts in zoning and development can concentrate industrial pollution in areas that are disproportionately populated by low-income communities and communities of color. Internationally, bioshield projects have also caused harm to marginalized communities. On the eastern coast of India, for example, coastal tree-planting projects intended to protect against tsunamis have appropriated land used by indigenous people, resulting in displacement and disruption of many fishing communities who depend on coastal access for their livelihoods. Furthermore, research on natural disasters has shown that social inequities also determine the impacts of disasters, not just their ecological or physical causes. For example, households and communities with less financial resources are more vulnerable to disaster impacts and face more barriers to recovery. Solutions to disasters must focus on reducing social disparities, not only on addressing environmental risks. Bioshields can be part of making whole communities stronger, if implemented as part of a broader disaster prevention plan. As we grapple with climate challenges, bioshields offer a useful path for increasing disaster resilience in communities across the globe. Beyond climate, bioshields can support healthier and more sustainable communities. But their implementation must be informed by current research and by lessons of the past. Local communities must be included in development processes to ensure context-specific and equitable ecological interventions. Affordable housing measures can help keep long-time residents housed and reduce environmental gentrification. Special attention should be paid to protecting historical and customary land rights and to ensuring sustainable livelihoods. And more research should focus on appropriately managing bioshields so that they most effectively address hazards within the context of changing social and meteorological climates. As the United States recovers from one of the worst years on record for natural disasters, the restoration and conservation of wetlands, forests, and urban green spaces should be integrated with community input into the recovery process. Skye Niles is Graduate Research Assistant and PhD candidate at University of Colorado Boulder. Photo Credit: Urban wetland, February 2010, courtesy of Flickr user La Citta Vita.